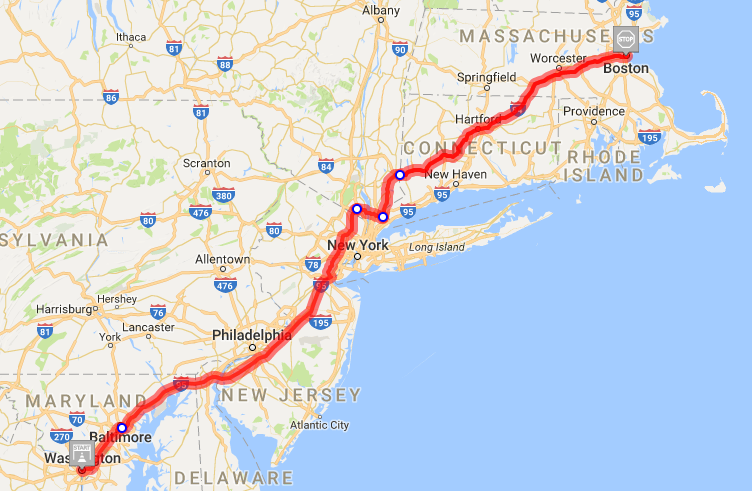 The point of the adventure is to explore, so rather than drive up I-95 like I always do, I took the parallel Baltimore-Washington Parkway instead. The thing about that road is that there are no mile markers nor mileage signs to keep a prospective of where you are. Unless you’re familiar with the area or you cheat and have a map open, you have no way of knowing how close you are to your destination. During the drive, I turned on the radio and listened to the local classic rock stations. I was amazed to discover that once I left the DC area, radio stations had personalities! I had been so used to DJs simply being used to plug their Facebook pages and segue into commercials, it was shocking to actually be interested in hearing what they had to say. I stopped for lunch at a rest stop along the New Jersey Turnpike. I was making very good time, but at some point one needs to stretch one’s legs, get some food, and most importantly, answer the call of nature. In the men’s room, I discovered about the most New Jersey thing possible: A syringe disposal box. I would hate to be the guy who had to clean that out every day. Each state has its own tendencies when it comes to the aggressiveness of its drivers. Virginia cops will aggressively pull anyone over who is going more than 10 miles per hour over the speed limit, which makes its drivers much more conservative than the speedsters in Maryland. However, New Jersey driving makes even Maryland feel docile by comparison. There are cars whizzing by going 90 miles per hour on the New Jersey Turnpike and no one cares. The only thing stopping them from going even faster is the rear bumper of the vehicle ahead of them. Once I finally left the vehicular anarchy of the Garden State, I felt a slight culture shock when I entered New York and all of a sudden everyone knew what a speed limit was. After briefly missing my exit onto I-84, I reached Connecticut. Apparently, it was prime construction season. I drove through identical town after identical town before finally reaching Hartford (there are tall buildings! ), followed by my first glimpse of nature in a long time. I reached Massachusetts, joined onto I-90 and about the tenth toll plaza of the day, and finally arrived at my lodging for the night. One of the perks of having a dad who worked as a sportswriter for twenty years is that he knows a lot of people all over the country who work in sports. It turns out that the Boston sportswriter is a very nice guy who arranged to get me a Fenway Park press box credential in return for helping him get quotations after the game. Obviously, I’m not going to pass up on the opportunity for free box seats, especially on a cold and damp night. Admittedly, it would be nice to be fully immersed in the crowd, but I am in no way in a position to complain. It’s been a productive first day, but I am certainly looking forward to tomorrow when I get to explore the city of Boston. My route for day 1. Crossing the Delaware into New Jersey Don’t worry, both hands are on the wheel. Phone mounts and voice commands are very convenient technologies. The leaves are starting to change in Connecticut. It’s a rainy night in Boston, but Fenway is packed.